The Mens Anatomica With Fly Boxers from Icebreaker is a classic, go-to boxer brief built with a super-soft, stretchy and highly durable merino wool blend, and outfitted with the support and comfort you need for both daily life and weekend adventures, the Anatomica Boxers w/ Fly are the underwear you’ve been searching for. 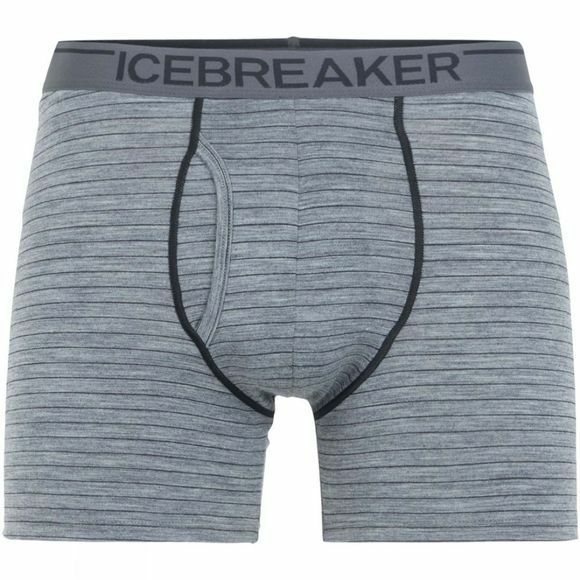 With an exclusive Icebreaker fit that makes them the most comfortable pair in your underwear drawer, the Anatomica Boxers w/ Fly also feature our corespun fabric, merino wool fibers wrapped around a nylon core, for increased durability and strength while retaining next-to-skin softness. Flatlock seams eliminate chafing when you’re on the move, and the contoured pouch with a functioning fly offers support and function.